Already a major international bestseller, now available in English for the first time: In An Appeal to the World, His Holiness the 14th Dalai Lama of Tibet illuminates the way to peace in our time, arguing for a form of universal ethics that goes beyond religion - values we all share as humans that can help us create unity and peace to heal our world. "All people are united in the pursuit of happiness and the desire to avoid suffering," His Holiness reminds us. "This is the source of humanity's greatest achievements." Our development relies on cooperation, not competition. We need to begin to think and act on "we humans" - we must stop focusing on what divides us and recognize our commonalities. Without secular ethics - what Albert Schweitzer referred to as "reverence for life" - we cannot solve all the problems we face. Working with trusted collaborator Franz Alt, the Dalai Lama calls on the better angels of our nature to tackle a wide range of contemporary issues, from war, violence, and intolerance to climate change, global hunger, and materialism. Applying the techniques and teachings of Tibetan Buddhism - from listening and contemplation to meditation and nonviolence - His Holiness provides a roadmap forward. Jetsun Jamphel Ngawang Lobsang Yeshe Tenzin Gyatso (born Lhamo Dondrub) , the 14th Dalai Lama, is a practicing member of the Gelug School of Tibetan Buddhism and is influential as a Nobel Peace Prize laureate, the world's most famous Buddhist monk, and the leader of the exiled Tibetan government in India. Tenzin Gyatso was the fifth of sixteen children born to a farming family. He was proclaimed the tulku (an Enlightened lama who has consciously decided to take rebirth) of the 13th Dalai Lama at the age of two. On 17 November 1950, at the age of 15, he was enthroned as Tibet's ruler. Thus he became Tibet's most important political ruler just one month after the People's Republic of China's invasion of Tibet on 7 October 1950. In 1954, he went to Beijing to attempt peace talks with Mao Zedong and other leaders of the PRC. These talks ultimately failed. 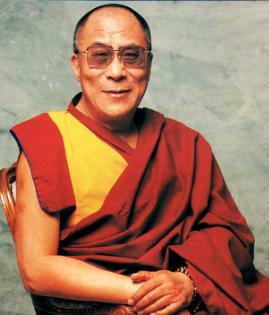 After a failed uprising and the collapse of the Tibetan resistance movement in 1959, the Dalai Lama left for India, where he was active in establishing the Central Tibetan Administration (the Tibetan Government in Exile) and in seeking to preserve Tibetan culture and education among the thousands of refugees who accompanied him. Tenzin Gyatso is a charismatic figure and noted public speaker. This Dalai Lama is the first to travel to the West. There, he has helped to spread Buddhism and to promote the concepts of universal responsibility, secular ethics, and religious harmony. He was awarded the Nobel Peace Prize in 1989, honorary Canadian citizenship in 2006, and the United States Congressional Gold Medal on 17 October 2007.